Few are more qualified than Cadel Evans to give tips on maintaining your bike. Kids’ bikes can be expensive, but with the right care they can last for years – even long enough to pass down from sibling to sibling. All it takes is some simple and regular maintenance. Basic bike maintenance is an easy, hands-on activity you and your child can do together. Older kids will feel more independent and responsible for their bike, while little ones will love the chance to learn and tinker away. Not only will regular maintenance keep your child’s bike running smoothly, it will also make it safer and easier to ride. 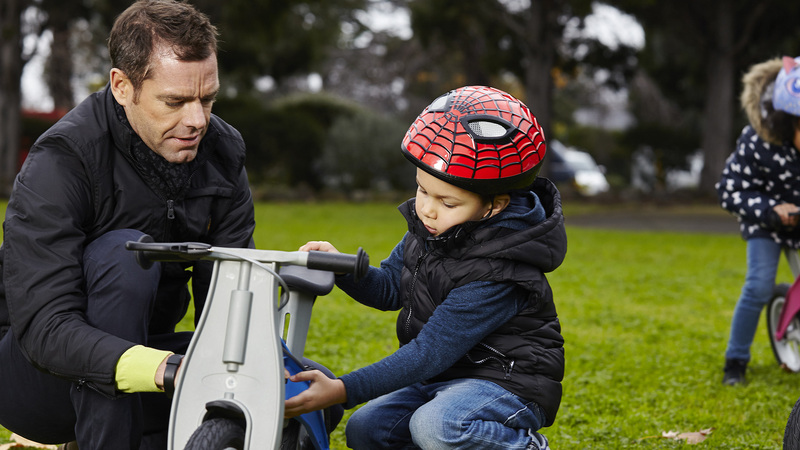 To get you started, cycling legend and Medibank ambassador Cadel Evans shares a handy bike maintenance schedule, that will keep your child’s bike riding like new. Brakes: Give both brakes a good squeeze to make sure they’re working properly. Check the brake pads to make sure they clear the wheel rim and are not too worn. Tyres: Fully inflated tyres make it easier to ride, so check the tyre pressure and add air if the tyres feel too soft. You’ll find the correct pressure written on the side of the tyre. Quick releases: A quick release is a lever or mechanism that allows you to take your bike wheels off quickly and easily. If your child’s bike has these, make sure they’re secured tightly. Bolts: Have a quick check for any loose bolts or parts on the bike. Bell or horn: Check that it’s working and loud enough for others to hear. Lights: If riding at night, check all lights are working and batteries are charged. "Fully inflated tyres make it easier to ride, so check the tyre pressure and add air if the tyres feel too soft." After riding in the rain or through mud, give the bike a wipe down to stop any rust or rotting. After riding in sand, clean the axles to keep the wheels spinning easily. Lubricate the chain with chain oil to keep it running smoothly and prevent rust. But don’t use too much – a thin layer is all you need. Give the bike a good wash using soap and water. An old toothbrush is a handy tool to help you clean the dirt from the chain and gears. After washing, lubricate all the moving parts with bike lubricant to keep them working smoothly. Don’t forget to re-oil the chain. Give the bike a thorough inspection to make sure everything is safe and in good condition. Check the frame for cracks, check the brake pads, check that the gears change smoothly, check that the handlebars align with the front forks, and check that the seat is secure and at the right height. If you need assistance, head to your local bike shop. "Give the bike a good wash using soap and water. An old toothbrush is a handy tool to help you clean the dirt from the chain and gears." Believe it or not, riding your bike will help it last longer. Regular use stops the bike’s moving parts from seizing up, so get riding! Store the bike correctly. Don’t leave it outside in the rain or sun, or next to extreme heat, like radiators, wood fires or heaters. Touch up any chipped paint sooner rather than later. Small chips quickly grow into big chips if not repaired. Teach your child to put their bike away properly. A bike left in the driveway can easily fall victim to a reversing car. If in doubt, take your child’s bike to a bike repair shop. Faulty repairs can damage or reduce the safety of your child’s bike. For more easy guidance, check out the Bicycle Network.